Every year my family celebrates Three Kings Day. 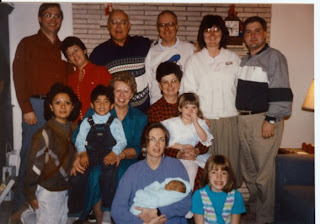 This is not an old family custom, but it came about when I married a Spaniard, and my cousin married a girl from Mexico. In both Spain and Mexico, and in other countries of the world, the Three Kings bring the holiday gifts to children, not Santa Claus. This means that the gifts do not arrive until January 6th! It's been fun to get our New England Yankee family together to celebrate together after the Christmas craziness is all over. We look forward to it every year, and cousins come from Maine, New Hampshire, Massachusetts and Rhode Island. I looked through our old family photos and found group pictures of the whole family over the past 25 years. Here is a sampling! 1991 in Holden, Massachusetts, my nephew was a few days old! This may be one of our first Three Kings parties. 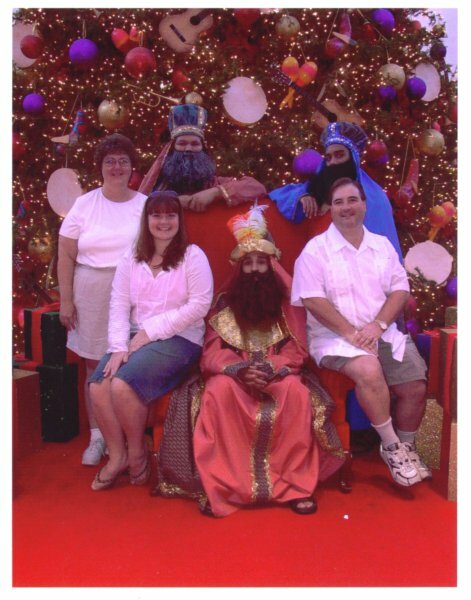 Plaza de las Americas, posing with Kings instead of Santa! 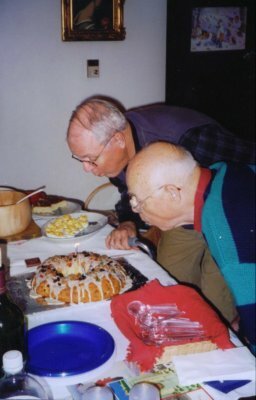 and Uncle Robert died in 2005.
on top of the Kings Cake! sent from See's Candies in California by our uncle. What a fun holiday! I'd never heard of it before. Lovely photos, especially of your dad and his brother. I'm sure that one has great sentimental value to you. The photo of everyone posing with their See's candies is so fun too. I'm from California, so I know the yummy goodness of See's candies.